Just a quick post tonight as I’ve been out for the evening to see Ex Machina – the latest film from Danny Boyle. Decent film, very sci-fi, but with an unexpected amount of muff on show. And I’m sorry, but there’s nothing more surprising than an unexpected muff. A muff you can plan for, fine, but no-one wants to be presented with a muff when you’ve got your guard down. To be honest, I just like typing that word. Muff. Ah. I was going to be good and be one of those bores who go out for dinner and just order lettuce leaves dressed in the tears of a fat man, with a side order of smugness, but instead we went to Nandos. Now see I don’t see the fascination with Nandos – to me, it’s KFC but with wooden furniture and hipster beards. They do pleasant enough food and all, but raving over it? No! I did make a mistake of choosing a table right near the toilets mind – I’m such a classy guy. They have those awful open back chairs too – I (and I imagine a lot of other larger framed folks share this fear) spend an inordinate amount of time worrying that my shirt had ridden up, my trousers have sank down and that the crack of my arse was busy winking at the rest of the diners in the restaurant. The last thing I want is for someone to post a business card in there thinking they’d win a half chicken and chips. BAH. Anyway, I had the caesar salad followed by an oil-drum of popcorn in the cinema later, and I don’t care – syns are there to be used, after all. Remember, I’m all about maintaining this week. So, tonight’s recipe…. Now, some people will probably consider the above to be a ‘tweak’ – tweaking is when you use something not for its ‘original use’ – i.e. grinding up couscous into flour to make a cake. The science being that you’ll stuff your face with a whole cake which might contain 500g of couscous, whereas if you tried to sit and eat that much couscous in one go you’d go pop. Well, balls to that. In the example below, I’m using lasagne sheets or ham to create a cup, but you’d eat the same amount if you were to have lasagne. So shut your hole. This is a ‘use up your leftovers’ recipe – this time, you’re using up any old bolognese (and you can find our recipe for bolognese with sluts spaghetti here) or chilli. Serve with a side salad or some sweet potato wedges for an easy win. recipe: easy! cook your lasagne sheets, cut them into squares and place one into the cup in a muffin tray, with another one rotated 45 degrees so you have a nice star. Stuff the bottom with rocket, spoon the bolognese into the middle, top with philadelphia and a tomato, and pop in the oven for 20 minutes! 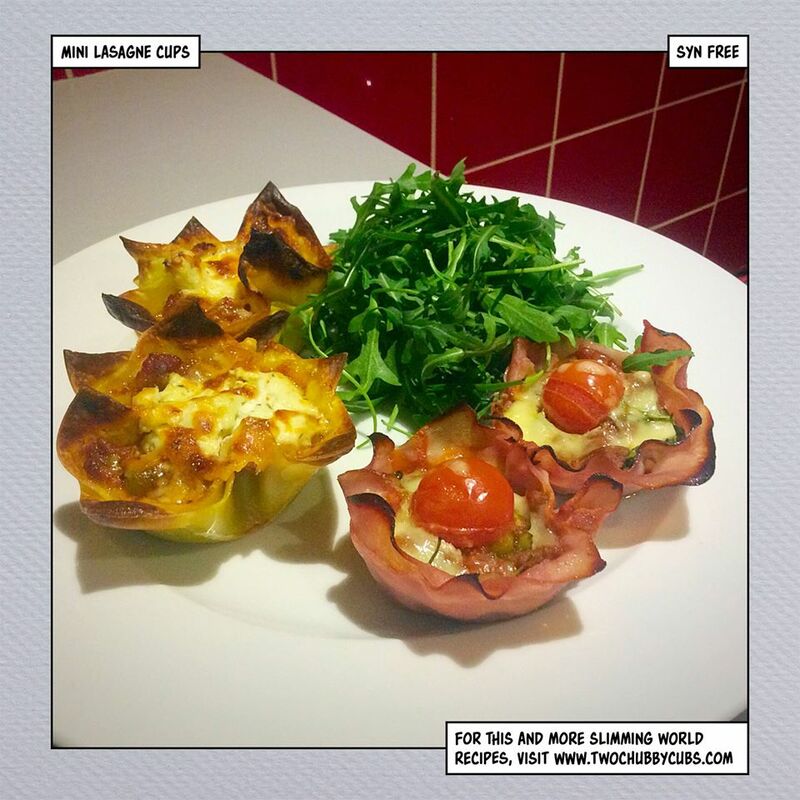 If you can’t be arsed fannying about with lasagne sheets, you can use ham – see the picture. Don’t cook it for so long though, ten minutes at most, or you’ll end up with a burnt rim – and no-one wants that! extra-easy: of course – syn-free. Better if your bolognese is stuffed with superfree nonsense, but if not, have a wee salad on the side. Easy peasy. what i would like to know is this recipe freezable ? ve reading your recipes and I crease up reading your blog. I really look forward to your stories and look forward to reading about your escapades -please don’t stop. I have a really good chuckle every day. Thank you. How do I follow you? I have stumbled across your page and I have never been happier to stumble upon something. Your blog is hilarious and you have a fantastic turn of phrase which has cheered me right up. Good luck on your slimming journey but you have the right mindset and attitude. Slowly, slowly, catchy monkey and you will get there no problem. I am still trying to catch the monkey myself ! Looking forward to your next update! OOooh! Thank you 😀 please let us know how you get on with any recipe you try – and thank you, we do try to please! Just found you! awesome ideas and you make me laugh! two of my favorite things….. Thank you!!!!!!!!!!!!!!!!! No plans to stop for a while yet! 😀 thank you! I lost 5.5 stones with Slimming World and used “tweaks” all the time, Ive just rejoined and was gutted to see that lasagne nachos are now forbidden. Glad to see someone ekse who cant see why shaping lasagne is any different to layering it!